NOTE Smoothie does not allow you to use a zprobe as an endstop. An endstops must be dedicated to being an endstop and cannot be used as a zprobe and vice versa. However, please note that the general feedback from the community, is that most of those are either less precise, less repeatable, or much more difficult to get to "work right", compared to the classical "mechanical" endstop. You want to connect the Signal ( green in the schematic ) and Ground ( blue in the schematic ) pins for the end-stop on the Smoothieboard, to the C and NC connection points on the end-stop. Make absolutely sure that you do not connect VCC ( red ) and GND ( blue ) to a mechanical (microswitch) endstop! Depending on your wiring that may fries your smoothieboard instantly or when the switch gets pressed. There is a wiring where this not happens and you switch the signal between VCC and GND, but if you're not careful enough you damage your board. There are more sophisticated endstops. Those are "powered endstops", for example : Hall-O ( magnetic ) or optical endstops. If once wired, your endstop reports the opposite of what it should via the M119 command ( 1 when not triggered, and when triggered ), see the "Testing" section. 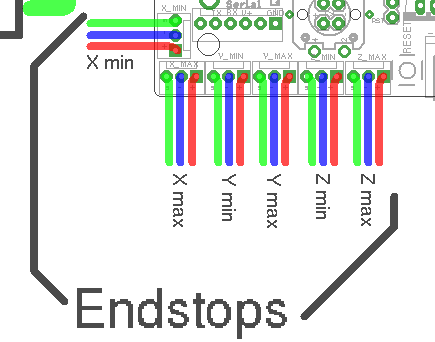 In some very rare cases, the endstop reading circuit on the Smoothieboard will not be adequate for your endstop type. In this case, you should use a "free" GPIO pin on the Smoothieboard that nothing else uses to connect your endstop to. Now in Pronterface, home one axis by clicking the small "home" icon for that axis. Begin with X, then Y, then Z. There is a command that allows you to debug this kind of situation : in Pronterface, enter the "M119" G-code.